This beautiful filly is by the late Sebring, one of Australia's greatest sires. The Champion two-year-old of his generation, Sebring provided Gai with her 5th Golden Slipper and 4th Sires Produce in his short but stellar career. A truly versatile sire, Sebring is the sire of five individual Group One winners and 53 stakes winners to date. Guineas, Derby and Oaks winners, Golden Slipper performers, A Horse Of The Year and a Melbourne Cup place-getter to name a few, all feature on his roll of honour. 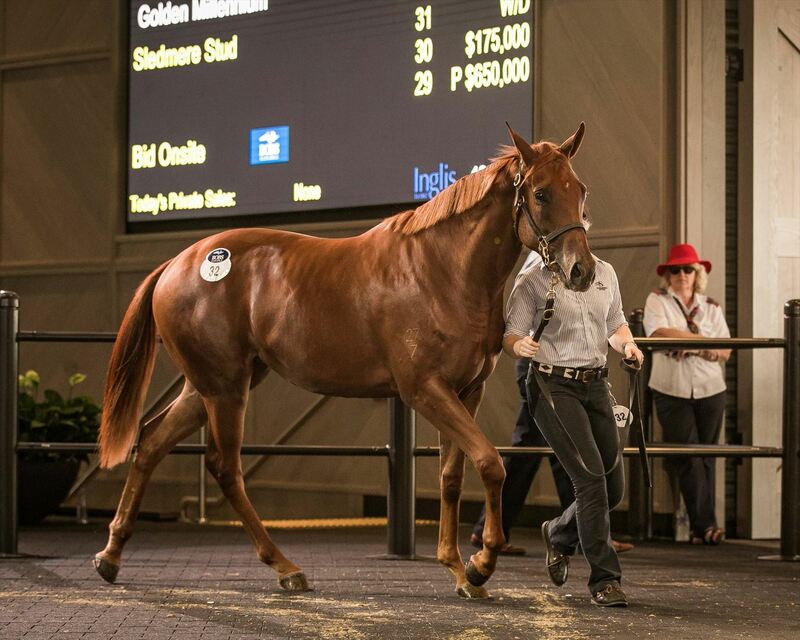 Our stable has experienced great success with Sebring's progeny to date including the likes of Group Two winners Sedanzer, Gold Standard and Master Ash and two-time listed winner Supply And Demand. This filly is out of the Dubawi mare and stakes winner Golden Millennium. Golden Millennium was a precocious juvenile winning a Listed race and placing in two further starts during her campaign. She is the dam of two foals to race, both of which are winners including the talented full sister to this filly Futooh, who was also a listed winning two-year-old. With juvenile speed and black-type performing sprinters all throughout her page, this filly has all the credentials to become a two-year-old stakes winner herself. 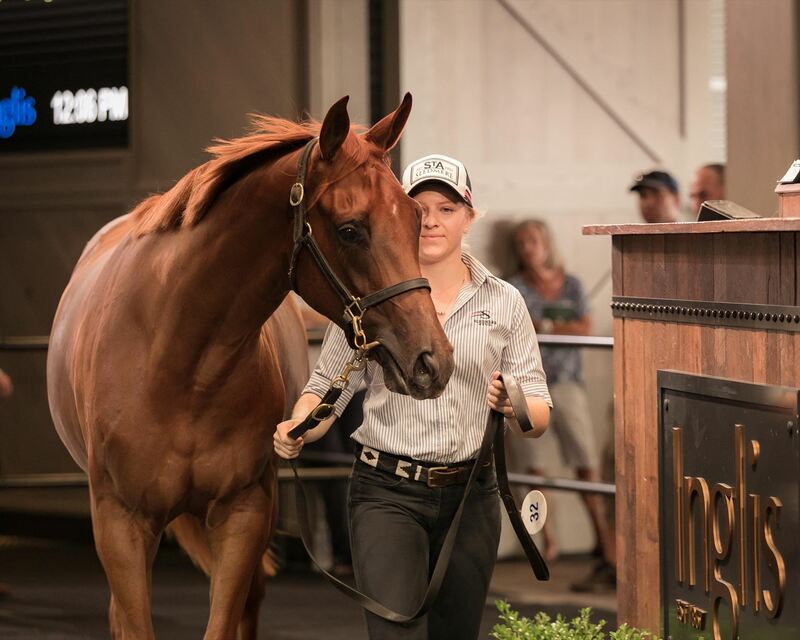 Beautifully bred, this filly was purchased very well at $300,000 and holds great residual value for the future. SEBRING (AUS) (Chestnut 2005-Stud 2009). 5 wins at 2, STC Golden Slipper S., Gr.1. Sire of 722 rnrs, 482 wnrs, 53 SW, inc. Criterion (Australian Derby, Gr.1), Dissident, Egg Tart, Amphitrite, Lucky Bubbles, Ringerdingding, Bring Me the Maid, Sesar, Sedanzer, Gold Standard, Seaburge, She Brings Joy, Catch a Fire, Hattori Hanzo - Let Us Win (H.K. ), Believe Yourself, Ulmann, Violate, Thurlow, Master Ash, Art Series, Broadband, Miss Admiration, etc. FUTOOH (f by Sebring) 2 wins at 2, A$231,350, in 2017-18, ATC Fernhill H., L, TAB 2YO H., 3d ATC Silver Shadow S., Gr.2, 4th VRC Schweppervescence Trophy, Gr.3, MRC Kevin Hayes S., Gr.3. Master Cramsie (g by Lonhro) Winner at 1300m in 2018-19 in Aust. GOLDEN MILLENNIUM (f Dubawi) Winner. See above. MISS KARIBA (f Lunchtime) 9 wins to 1500m, A$300,430, STC Canterbury S., Gr.2, Birthday Card H., L, AJC Guildford Welter H., Dark Jewel H., STC Happy Valley H., Fiji H., AJC Hi-Jinx H., STC Plaza TAB H., 2d AJC Galaxy H., Gr.1, Analie H., L, Analie P., City Tatt's RC George Buxton H., AJC Lord Ben H., Northwest Business Class Quality S., City Tatt's RC NSW Bookmakers Co-Op Society H., 3d STC Daily Juice Company H. Producer. SUPERSNACK (c Lunchtime) 23 wins-1 at 2-from 1000m to 2200m, A$245,625, Rockhampton Cup, L, QTC USS Pensacola H., Honda Australia H., Mister Hush Welter H., Curragh Welter H., Justincase Welter H., Capalaba H., G Macquarie H., 2d Qld Tatt's RC Tattersall's Mile, L, BATC Clan Campbell Scotch H., Premiership Welter H., Rain Lover H., QTC Night Charmer Int H., Cannon Welter H., Denises Joy Welter H., 3d QTC Bribie H., L, Playground & Recreation Welter H., BATC Sir Tristram Flying H., Gunsynd H., Strawberry Road H., QTC Holly S., 4th Toowoomba TC Weetwood H., L.
Old Castle (g Princelone) 8 wins at 1000m, 1200m, 3d VRC Maribyrnong Trial S.
WHOEVER (f Redoute's Choice) 3 wins at 1100m, 1200m, A$171,800, AJC Nivison H., L, STC Mad About the Hat Day H., 2d AJC Sapphire S., Gr.2, Challenge S., Gr.2, City Tatt's RC Lightning H., L, STC Thursday Night Racing in December H., 3d STC Theraces.com.au H. Producer. 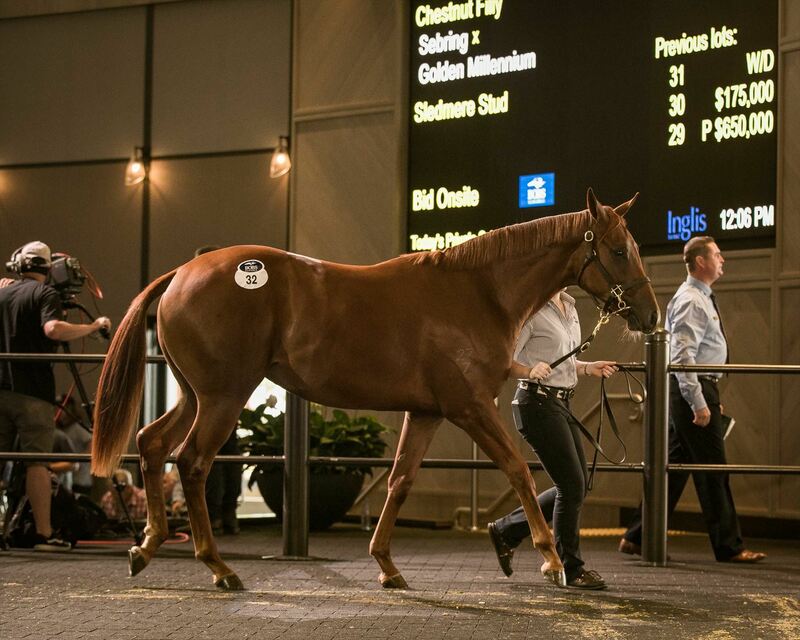 SILVERSTREAM (f Al Maher) 9 wins-1 at 2-to 1400m, A$709,400, to 2017-18, WATC Lee Steere S., Gr.2, AJ Scahill S., Gr.3, Northerly S., Gr.3, Jungle Dawn Classic, L, Westpeed Nursery H., Seacorp H., Tabtouch H., Merrywell H., Variety at the Races H., 2d WATC La Trice Classic, Gr.3, Starstruck Classic, L, RS Crawford S., L, Birthday S., L, 3d WATC Miss Andretti S., L, 4th WATC Winterbottom S., Gr.1, La Trice Classic, Gr.3. SWEET AND SPEEDY (f Street Cry) 3 wins-1 at 2-at 1200m, 1400m, A$166,975, VRC Vanity S., Gr.3, MRC Ian Miller H., 3d SAJC National S., Gr.3. CALANDA (g Snitzel) 6 wins at 1100m, 1200m, A$563,825, to 2017-18, Clarence River JC Ramornie H., L, Gosford RC Takeover Target H., L, ATC Inglis Sprint, Schweppes H., Bowermans Office H., Schweppes P., 2d BRC George Moore S., Gr.3, 3d SCTC Moreton Cup, Gr.2, ATC Membership H., 4th VRC Mss Security Sprint H., L, ATC Razor Sharp H., L.